Three members of the Fairfield FFA Chapter recently left for a once in a lifetime experience — the Washington Leadership Conference. During the days spent in the nation’s capital the members got to tour the area and see all of the city’s monuments and landmarks. They learned about the influential people who inspired the monuments and their impact on the country. The conference focused on giving back to their own communities and being an active citizen. The members including Teigan Thackston, Brayden Heizer and Bri Burleson created their own “Living to Serve” programs that they plan to bring back to make an impact on their hometown. The students attended workshops that focused on the motto “Doing what we can with what we have, where we are.” The members described the conference trip as “life changing and impactful.” They are encouraging their fellow members to attend the Washington Leadership Conference in the future. 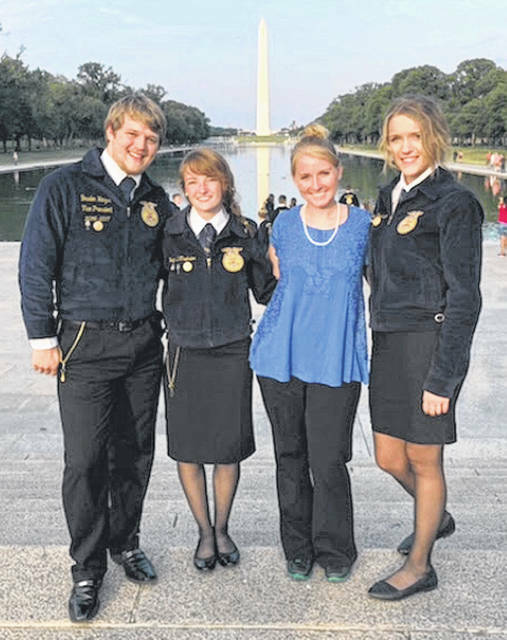 https://www.timesgazette.com/wp-content/uploads/sites/33/2018/08/web1_FFA-pic-1.jpgThree members of the Fairfield FFA Chapter recently left for a once in a lifetime experience — the Washington Leadership Conference. During the days spent in the nation’s capital the members got to tour the area and see all of the city’s monuments and landmarks. They learned about the influential people who inspired the monuments and their impact on the country. The conference focused on giving back to their own communities and being an active citizen. The members including Teigan Thackston, Brayden Heizer and Bri Burleson created their own “Living to Serve” programs that they plan to bring back to make an impact on their hometown. The students attended workshops that focused on the motto “Doing what we can with what we have, where we are.” The members described the conference trip as “life changing and impactful.” They are encouraging their fellow members to attend the Washington Leadership Conference in the future.